who are based on or born in the UK - England, Scotland, Wales and Northern Ireland. This list is not yet complete - and is a work in progress. The Artists page sets out the ​guidelines and criteria I use to determine which artists to include on this website (i.e. so that it is consistent across both continents and countries). ​If you believe that you should have a mention on this page please contact me. Watercolour painters who are best known for their work in another medium are highlighted below with a crossreference to the other media sections below. ​Awarded a Gold Medal by the Royal Horticultural Society for a series of 8 paintings of Rhododendrons. Studied studied Graphic Design at Medway College of Design and Wildlife Illustration Course at the Dyfed College of Art in Carmarthen. Worked as a commercial illustrator of plants for publishers, packaging and the advertising industry. Her work is in many private collections and has been sold in auctions by Christies and Sothebys. b.1948 Principal of the Chelsea School of Botanical Art and Former Director of the Diploma in Botanical Illustration from the English Gardening School (which she graduated from). Exhibits and teaches internationally and has works in collections at Kew, the Hunt, Highgrove Florilegium and Hampton Court Palace Florilegium. Fellow of the Chelsea Physic Garden Florilegium. Past President of the Society of Botanical Artists. ​​Works in watercolour.​ Work in the Shirley Sherwood Collection. She has extensive experience in developing complex patterns as both a Surface Pattern Designer and illustrating for the greeting card industry. Yvonne Marie Arnsdorf GM - one of the first RHS Gold Medal winners I ever met at RHS London Botanical Art Show in 2007 - when the exhibition was very small! She has no website.​ She has a BSc (Hons) in Botany/Biochemistry from St. Andrews University, UK; an MSc (St. Andrews) and a PhD from Reading and works as a researcher for Pest Organisms Threatening Europe. 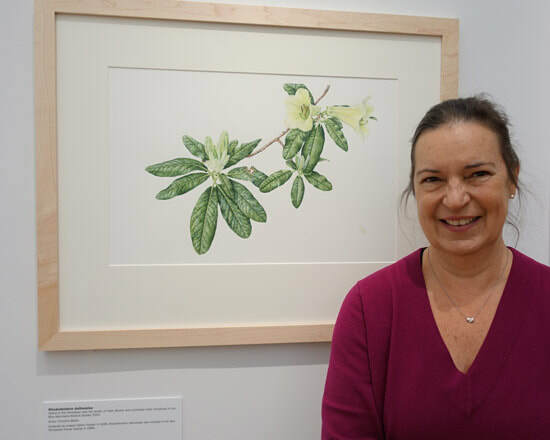 Yvonne Marie Arnsdorf won a GM in 2007 with an exhibit titled "Botanical Elegance"
​Claire Banks - Botanical Illustrator working at the RBGE on various flora. Tutor for the RBGE Diploma Course. 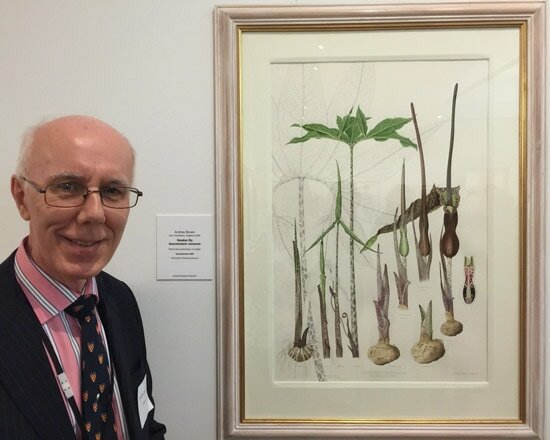 Awarded the Jill Smythies award for Botanical Illustration by The Linnean Society in 2015. ​Awarded an RHS Gold Medal in 2010 for eight paintings of New Trees. Contributes to the Chelsea Physic Garden Florilegium and the Transylvania Florilegium. Exhibited with the Hunt Institute and ASBA. Regularly illustrates plates for Curtis’s Botanical Magazine. "Christine is an amazing plants person with a passion for trees. ....She is also a talented botanical artist, using her plantsmanship to express her passion in art." b. 1949 in Bristol. Began botanical painting in 1996 for The English Gardening School Diploma Course. with Anne Marie Evans. Has work in The Shirley Sherwood Collection and the Highgrove Florilegium. Her Australian Tree Fern painting adorns the front cover of Shirley Sherwood’s Book A New Flowering; 1000 Years of Botanical Art. Won seven Gold Medals from the RHS for studies of camellias, orchids, heritage vegetables, narcissi, carnivorous plants and two collections of hellebores. and does commissions for Curtis's Botanical Magazine. Work included in collections of the RHS Lindley Library, Kew Gardens, Dr Shirley Sherwood, The Royal Hospital Chelsea and a private Royal collection. She also contributed to the Highgrove Florilegium. More recently she has been commissioned to produce designs for fabrics and Fleurs de verre. Based in Falmouth she also provides tuition. Founder member and Chairman of the Florilegium Society at Bedgebury National Pinetum. Previously a teacher of fine art at the Kent Institute of Art and Design in Canterbury. Also a painter of the Brogdale Art Group, based at The Brogdale National Fruit Collection, Faversham, Kent. 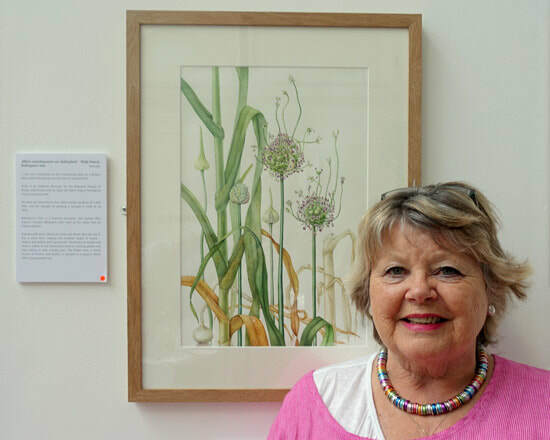 Started botanical art in 2010 and won an RHS Gold Medal in 2014 for her series of drawings in coloured pencil and graphite of "Apples - A Wisley Pomona"
Awarded six Gold Medals and one Silver-Gilt Grenfell Medal. Her work is held in the RHS Lindley Library, the National Gallery and Museum of Wales and the Dr. Shirley Sherwood collection.​​​ In 2007 she won her GM for eight paintings of auriculas. ​Claire Dalby GM RE RWS - Has painted fungi and lichens for more than four decades. 1994 Jill Smythies Prize, Linnean Society of London, 1995 RHS Gold Medal, 2006 RCGS GM. 2010 Solo exhibition at the RBGE. Collections which include her work: Ashmolean Museum, Oxford; Fitzwilliam Museum, Cambridge; Natural History Museum; Hunt Institute, Royal Collection and the V&A Museum. 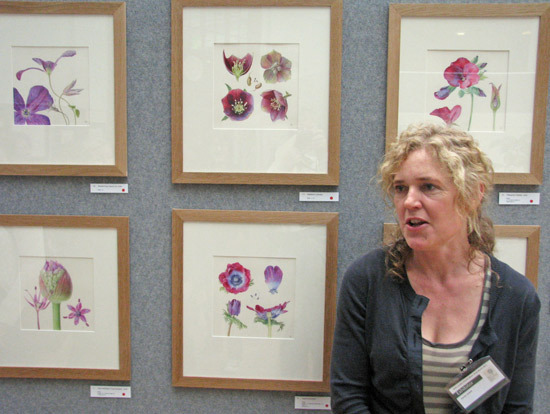 ​Gaynor Dickeson Member of SBA and ASBA who has exhibited at the RHS and the Hunt. Member of the Chelsea Physic Garden Florilegium and Association of British Botanical Artists. ​Elisabeth Dowle GM - specialises in painting crops and fruit. Seven RHS Gold Medals. Paintings included in the RHS Lindley Library, the Hunt Institute for Botanical Documentation, the Shirley Sherwood Collection, the Wellcome Institute for the History of Medicine and Highgrove Florilegium. Her botanical artwork is included in numerous publications. Worked for many years as a plant illustrator in line drawing, for botanists in Oxford and the Royal Botanic Gardens Edinburgh. 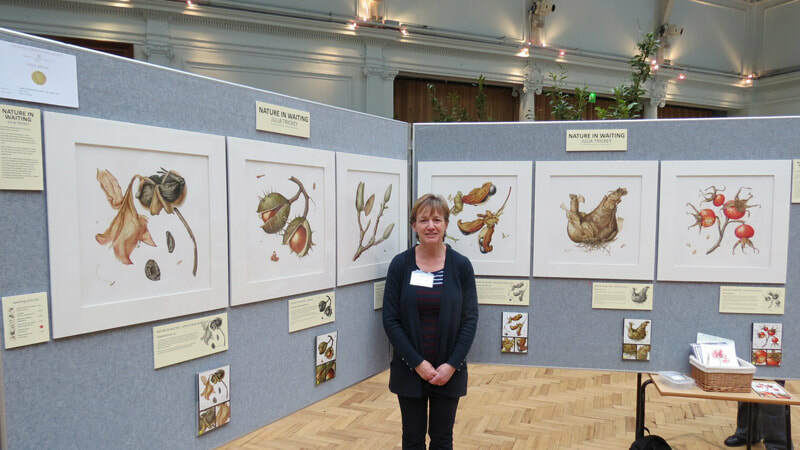 Graduate of RBGE’s Diploma in Botanical Illustration (with distinction/ Best in Year). Has earned a BISCOT Gold Medal in 2012 and an RHS Gold Medal in 2014 (Malvern). Her watercolour painting of Giant Hogweed was purchased by the RHS Lindley Library. 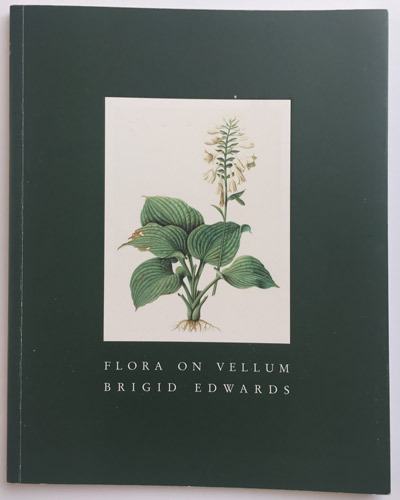 Catalogue for Brigid Edwards's 'Flora on Vellum' Exhibition (1995) - the first of her five solo exhibitions at Thomas Gibson Fine Art. Brigid Edwards GM - Characterised by Shirley Sherwood as a trailblazer. Brigid was inspired by Franz Bauer and started painting plants in the mid 80s. She has been painting on vellum and exhibiting her work widely since 1990. She has work in the Hunt, Lindley Library, RBG Kew and Shirley Serwood Collections. ​Former Director of the Diploma Course in Botanical Painting at the Chelsea Physic Garden, England (1993) . She has also taught botanical art and master classes at the New York Botanical Garden and internationally for many years. Author of An Approach to Botanical Painting (1993). A champion of 'the Florilegium' and Honorary President of the Chelsea Physic Garden Florilegium Society. 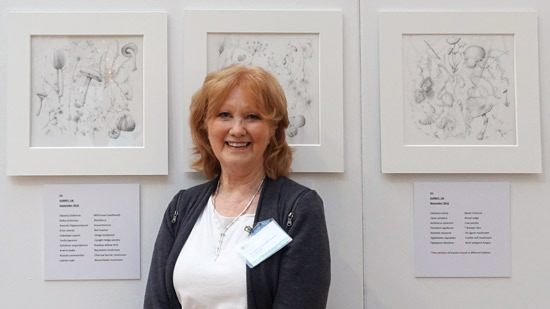 She was awarded the Veitch Memorial Medal in 2005 by the Royal Horticultural Society for the role she has played in the “resurgence of interest in and greater understanding of the depiction of plants" and an MBE for services for botanic art education in 2015. 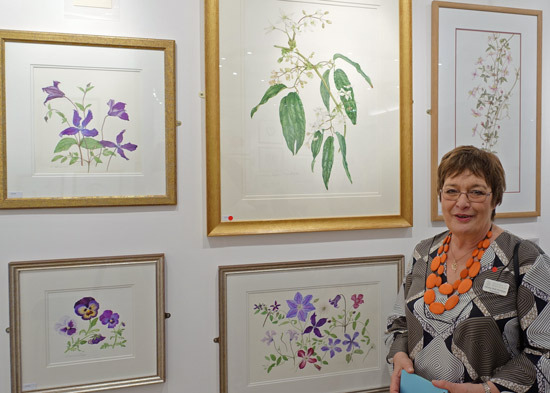 She is a Fellow of the Linnean Society, Honorary Director of the American Society of Botanical Artists, and Founder President of the Leicestershire Society of Botanical Illustrators. 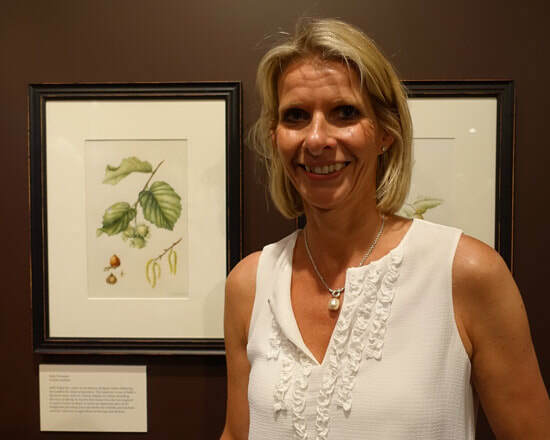 See also Anne-Marie Evans awarded M.B.E - for Botanical Art and Education and an article about her approach to Teaching, Learning, & Botanical Art. ​​This book has been much in demand ever since it was published in 1993. So much so that this book is now out of print. Although Anne-Marie still teaches around the world you'll very lucky if you ever get to do a class with her. However this book is the next best thing. While we wait for a revised edition, the best you can hope for are deep pockets for what it's going to cost you to find a second hand edition in the marketplace. ​You can look all you like but I very rarely see this book at anything less than three digits. b. 1950 in Melbourne. Australia but brought up in Ingleborough, Yorkshire. Awarded a Churchill Travelling Scholarship in 1977, used for drawing illustrations of the Flowers of the Himalaya. 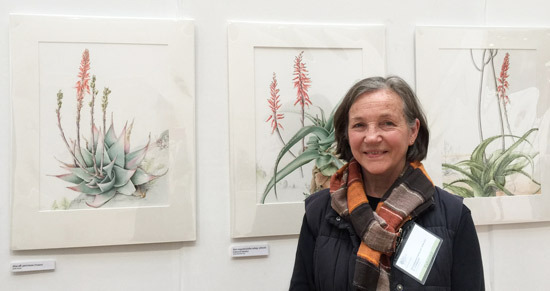 She worked as a botanical illustrator at RBG Kew for over 30 years and has drawn and painted very many plants for Curtis's Botanical Magazine, The Plantsman and The New Plantsman. She also taught botanical illustration at Kew. Exhibited at Kew Gardens Gallery, Hortus and the Hunt. Awarded six Gold Medals by the RHS and the Jill Smythies Award by the Linnean Society (she was the first recipient). Member of the RHS Picture Committee. One of her ancestors is Reginald Farrer the famous botanical explorer and plant hunter and 'father of rock gardens'. graduated from Reigate School of Art and Design then worked as a calligrapher and heraldic artist for 10 years for the College of Arms in London, Inns of Court and London Livery Companies before developing an interest in botanical art. Exhibited at the 15th International Exhibition at the Hunt. Member of the Chelsea Physic Garden Florilegium Group. This book records 18 years of dedicated work by members of the Florilegium Society. 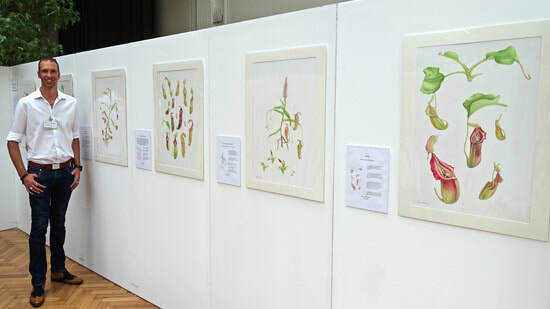 There are now over 140 paintings in the archives donated by 31 different botanical artists - past and present - many of whom have exhibited nationally and internationally and some of whom hold RHS Gold medals for their work. Based in Hampshire. Diploma in Botanical Painting & Illustration with Merit from the English Gardening School. Joined the Eden Project Florilegium Society in 2004 and became Chairman in 2012; elected a Fellow of The Linnean Society of London (FLS) in 2013. Member of RNGS Florilegium Society. GM in 2015 for "Arisaemas for the Sheltered Garden or Greenhouse". 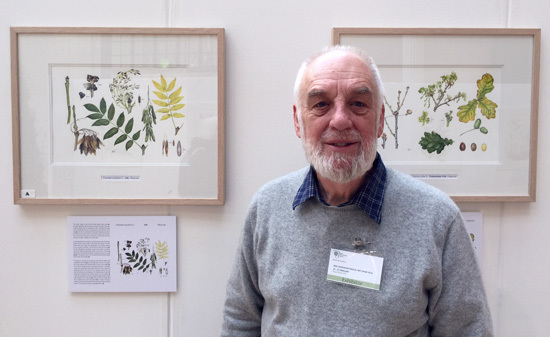 Author of A Coming of Age: Celebrating 18 Years of Botanical Painting for the Eden Project. Work in the RHS Lindley Library, Eden Florilegium, RBGS Florilegium collection and Private Collections. Has taught botanical art since 2008. Exhibited nationally and internationally ('Botanica' at RBGS 2016-2018; SBA at the Palmengarten 2016; and Real Jardin Botanico in Madrid in 2018). Studied Fine Art at Bristol. 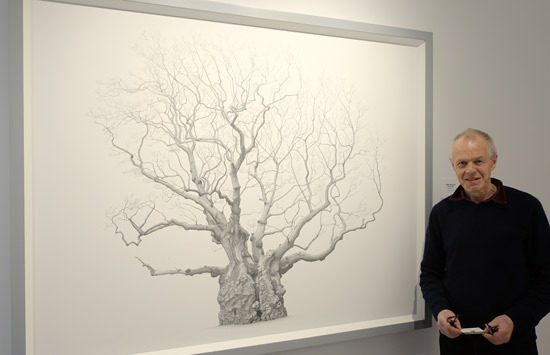 Created a series of 20 large drawings of ancient oak trees in the UK - believed to be over a 1,000 years old. The project took over three and half years and was sponsored by Felix Dennis who bequested 10 of the drawings to the Royal Botanical Society's Collection at Kew Gardens and 10 to the new Heart of England Forest. 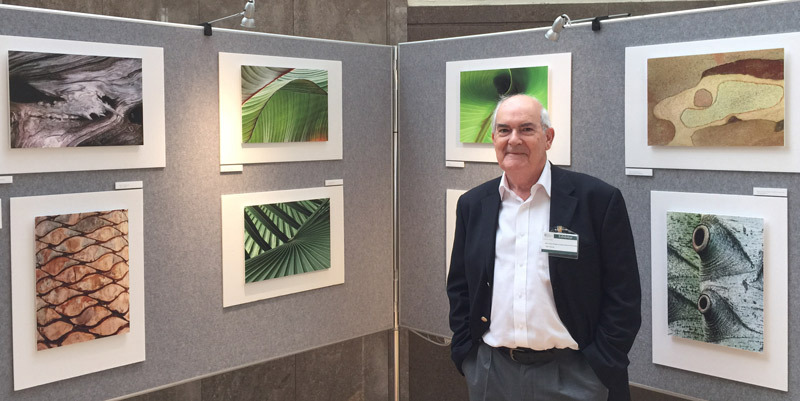 His work was exhibited in the large gallery at the Shirley Sherwood Gallery of Botanical Art in 2018/19. Diploma in botanical illustration at the English Gardening School. Fellow of the Hampton Garden Florilegium Society and member of the Sydney Florilegium Society and the Nymans Florilegium Society. Work in the Hunt Collection. ​Based in North Yorkshire. 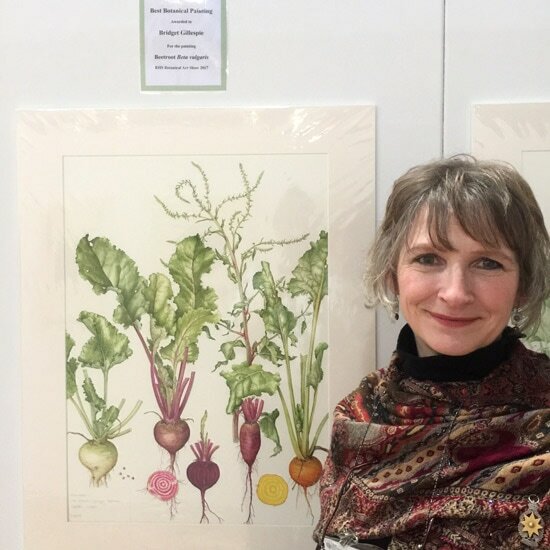 She has been a botanical artist since 1992, Bridget has won three RHS Gold Medals and in 2017 her painting of beetroot also won Best Painting in Show. She works to commission. She also teaches botanical art at Helmsley Walled Garden. b.1955. Qualified Landscape Architect. Member of the Leicestershire Society of Botanical Illustrators; Fellow of the Chelsea Physic Garden Florilegium Society (from 2002). Her work is held in the permanent collections of the RHS Lindley Library, The Highgrove Florilegium, The Hunt Institute and the Chelsea Physic Garden. Teaches for the Chelsea Botanical Art School. On the selection Panels for LSBI and Eden Project Florilegium Society. Exhibited at the 12th International at the Hunt in 2007, the Natural History Museum and Shirley Sherwood Gallery. ​​Norma Gregory GM SBA (2006, 2009, 2011). ​Norma is self-taught and was originally a natural history artist. She won her first Gold Medal (for Tree Seedlings) the same year she took up botanical art. Her 2009 medal was about Aspects of Garlic. Her 2011 medal was for Rooted Fascination which was about roots and root vegetables. The Rheum in the photo of Norma was purchased by the RHS for the Lindley Collection and she also has work in the modern botanical collection of the Natural History Museum. She hs a a post-graduate Diploma in Adult Education, is a Fellow of Chelsea Physic Garden Florilegium Society and has work in the Hunt and Natural History Museum. Part of a GM series, "Rooted Fascination" by Norma Gregory GM (2006, 2008 and 2011) exhibited: RHS London Orchid and Botanical Art Show 2011. Gold medal. Purchased by the Lindley Library in 2011. 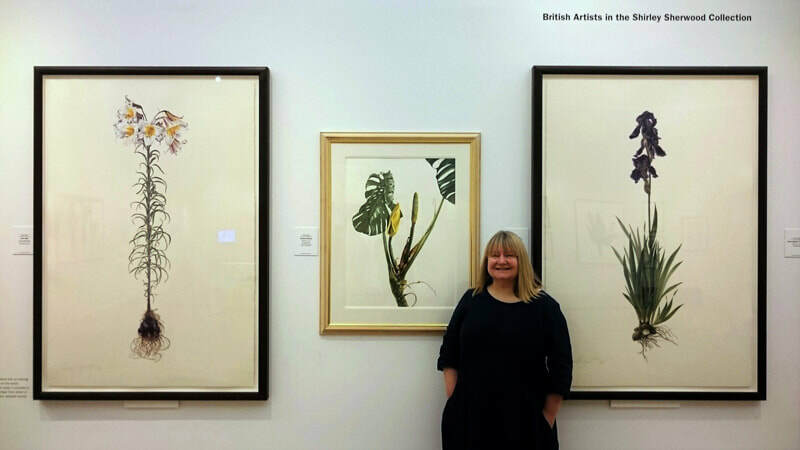 Coral Guest with the display of three of her five paintings in the "British Artists in the Shirley Sherwood Collection" at Kew in 2017. Coral Guest's life size paintings are hugely impressive. I've seen her naturalistic approach to painting and it's beautiful and botanically correct, plus her paintings have a huge impact. It's absolutely no surprise she's completed a number of commissions for Shirley Sherwood. Coral talks in her book about how best to achieve not only the colours but also the textures and shadings that are so important in painting flowers. It includes a number of step by step demonstrations. This book is not being reprinted which means that 'new' versions are already hugely expensive (£100+). However used versions in very good condition are still available for a reasonable sum. I'd advise getting a copy now - prices will only go up. Christina Hart-Davies GM and (top left) "Skeleton Crew" which is now part of my collection! ​​See '"A Wild Plant Year" exhibition and book by Christina Hart-Davies' for my review of this book. ​b. Nara, Japan 1954 but now lives in the UK. Studied botanical illustration with Judi Stone at Kew. She has two RHS gold medals plus two Silver-Gilt Medals, two Silver Medals. In May 2006, she became the first recipient of the Royal Horticultural Society Dawn Jolliffe Botanical Art Bursary and went to Peru to photograph, draw and paint orchids. She exhibited at the 12th International at the Hunt in 2007. Her work is included in the Highgrove Florilegium, the RHS Lindley Library, the Hunt Institute and the Royal College of Physicians where she was artist in residence. She teaches botanical illustration. Her work has also been selected for inclusion in the Transylvania Florilegium. MA in Illustration (Birmingham). Had work in A New Flowering: 1000 Years of Botanical Art exhibition at the Ashmolean Museum and two works are owned by Shirley Sherwood. Denise Heywood - Initially trained in textile design. Member of the SBA and Royal Society of Miniature Painters, Sculptors and Gravers. Exhibited at Hunt 15th International and ASBA 19th International. Helga Hislop FLS FSBA - (Formerly Helga Crouch). She has a great gift for recording the small and inconspicuous, the ‘found’ objects in our gardens. Awarded three medals by the RHS including two Gold Medals for ? (2005) and "Winter Wayside Weeds" (2012) Exhibited at the 12th International at the Hunt in 2007. Her work is included in the permanent collections of the RHS Lindley Library, the Hunt and the Sheffield Florilegium Society Archive. b. 1977 in Cambridgeshire; now lives in Cornwall. 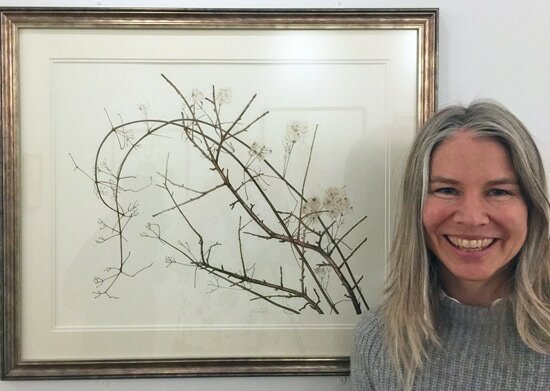 Sarah is a botanical artist, a natural science illustrator, author and tutor. Graduated from Falmouth University with an Honours Degree in Illustration. She is represented by the Wildlife Art Company for illustration work. She was their very first female Scientific and Natural History Illustrator. In 2018 she was awarded a Gold Medal by the RHS for Medicinal Fruits and their symbiosis with Pollinators (after a previous Silver and then Silver Gilt). 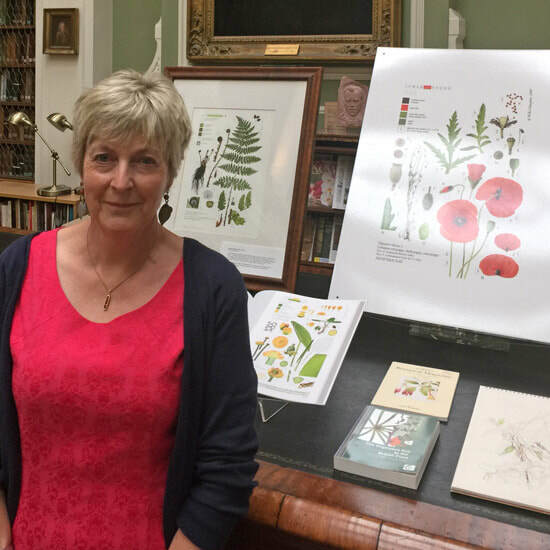 ​She delivers workshops on Botanical Illustration in Cornwall and in June 2017, her first book Botanical Art with Scientific Illustration was published. Sarah Jane Humphrey with two of her paintings in her Gold Medal winning exhibit "Medicinal Fruits and their symbiosis with Pollinators"
​Carolyn habitually produces small paintings with lots of exquisite content and masses of detail. Her 2011 Gold Medal was for The Anatomy of Flowers - and her display also won Best Exhibit. ​​She also has two paintings in the RHS Lindley Library Collection and a painting in the Hunt Collection. ​Winner of 4 RHS Gold Medals. Work included in permanent collections of the Hunt, Kew, RHS Lindley Library; the Highgrove Florilegium and private collections including Shirley Sherwood and that of the late Diana, Princess of Wales. She also designed the RHS Chelsea Plate in 1992. Ex President of the Society of Floral Painters. Lives in Silchester. She also teaches. Botanical paintings don't need to be large to be effective. 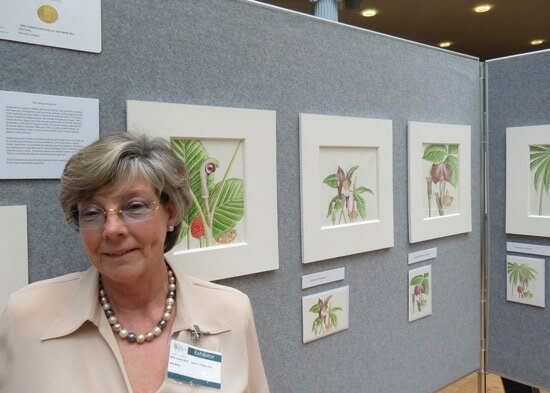 Carolyn Jenkins with her suite of paintings called "The Anatomy of Flowers" which won a GM and of 'The Best Exhibit Award' at the RHS Botanical Art Show in the Lindley Hall in 2011. 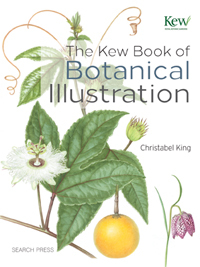 ​This is the first art instruction book by the Royal Botanic Garden at Kew. It covers: Materials; choosing a subject; review of different techniques for illustrating plant material; organisation of your workspace; drawing from life; composition, handling light and shade; techniques for sketching and drawing; technical illustration tools and techniques - use of magnification (binocular magnifier and a lens on a stand) and dividers; transferring the drawing and shading; techniques for using watercolour, gouache and pen and ink - and correcting mistakes; comprehensive techniques for painting leaves and flowers - including dissection and how to display details; preserving specimens and working from pressed specimens; approaches for illustrating cacti and succulents and trees; keeping a wild flower sketchbook and drawing while travelling (including kit). It finishes with examples of colour plates for Curtis's Botanical Magazine and tips on how to design a plate. 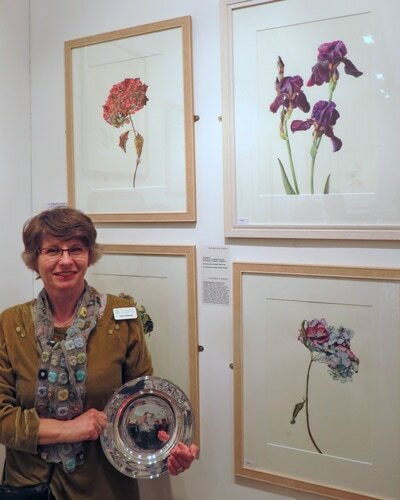 ​Louise is one of a few artists to have won a Gold Medal working in different media - her first was for pencil artwork of Native Ferns of the Peak District when she also won Best Exhibit in the RHS Botanical Art Show 2012. Her second was for watercolour paintings of orchids in Menorca. Joanne Langhorne is a botanical illustrator who has painted frequently for Curtis's Botanical Magazine. 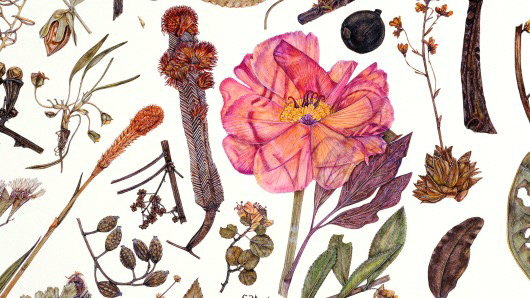 ​A botanist, a botanical artist and illustrator and a botanical author. She is also an experienced tutor and teacher of botany, ecology and biology. She is a Fellow of the Hampton Court Palace Florilegium Society (HCPFS) and is their Honorary Botanist (botanical advisor). 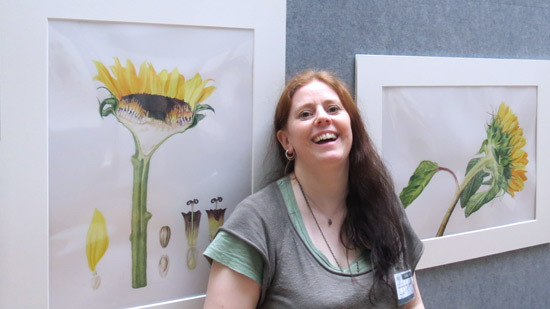 She is also a member of the Institute for Analytical Plant Illustration (IAPI) and the American Society of Botanical Artists (ASBA). Images lean towards photos rather than drawings or paintings but these relate closely to points being made about different characteristics which need to be highlighted in a drawing or painting. One of the Principal illustrators authors of botanical art instruction books associated with the Eden Project. She has taught courses for the Eden Project, Field Studies Council and internationally. ​​Anna Mason GM (2007 + Best in Show Award). 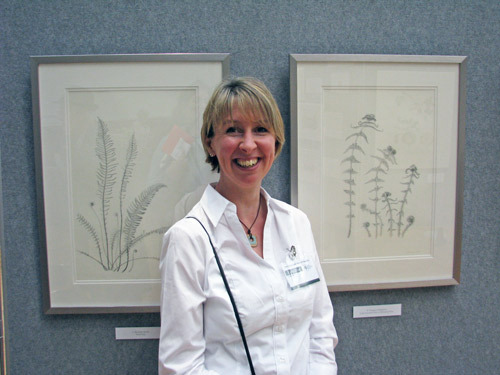 Angeline was awarded an RHS Gold medal at her first exhibition, at the RHS Exhibition Halls in London in November 2007 for her exhibit "Plants with Animal Names in their Common Names". She's also a Fellow of the Linnean Society​​ and her work is included in the collections of the Lindley Library and Dr Shirley Sherwood. 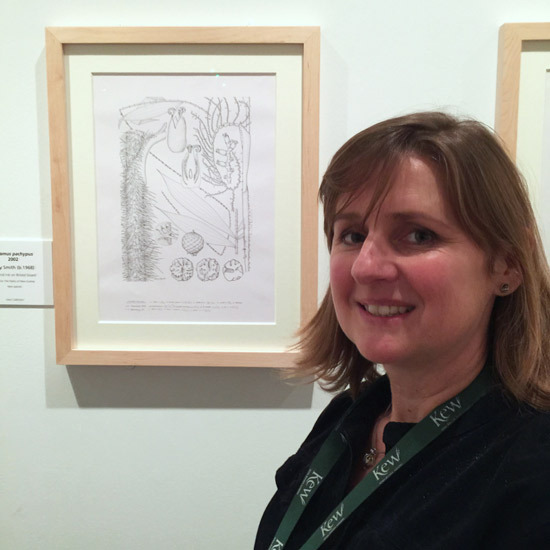 She has also contributed work to the Hampton Court Florilegium Society (her artwork). Susan Ogilvy GM - Born in 1948 in Kent and lives in Somerset. She qualified as an occupational therapist and used painting professionally as part of art therapy. Her botanical paintings have been exhibited at the Ashmolean, Smithsonian, Hunt and Kew. 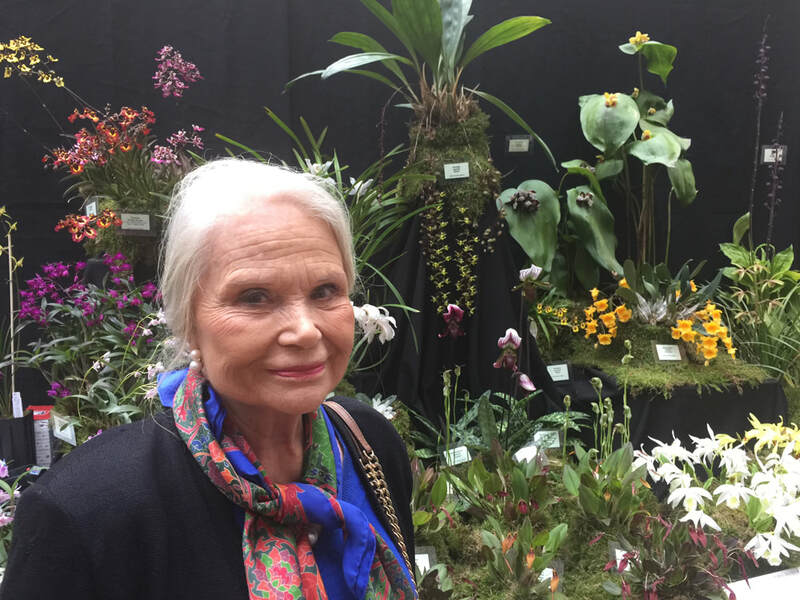 Her work is included in numerous collections including the Shirley Sherwood; Hunt Institute; Isaac and Alisa Sutton collection and the Highgrove, Transylvania and RBG Sydney Florilegiums. She has been awarded a Gold and Silver-Gilt Medals by the RHS. She designed and illustrated Overleaf, a book on British trees published in 2013 by Kew Publishing. The paintings for the book were also exhibited at Kew. Her work is available from Jonathan Cooper's Park Walk Gallery. 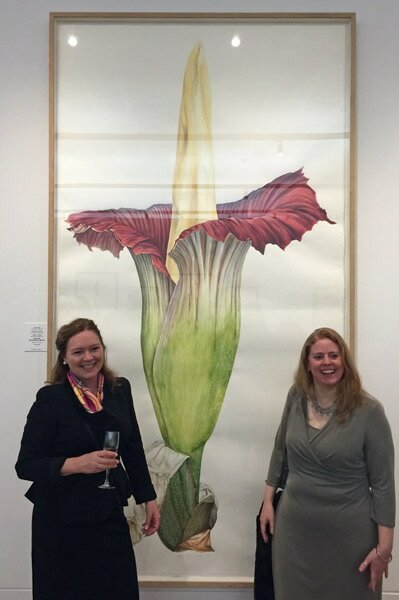 Life size painting of the Titan Arum at RBGE painted by Jacqui Pestell MBE (on left), Sharon Tingey GM (on right) and Işık Güner GM. RBGE attracted around 10,000 visitors over the three day period and the idea to paint the inflorescence at its prime, and full-scale, thus brought many challenges, not least its size. It required three artists – I was joined by Isik Guner and Sharon Tingey – to paint this 2.67m high specimen in the conditions of the Glasshouses. We were surrounded by the scent of putrefaction and the visitor stream from morning to night over the three days before collapse of the central spadix occurred. 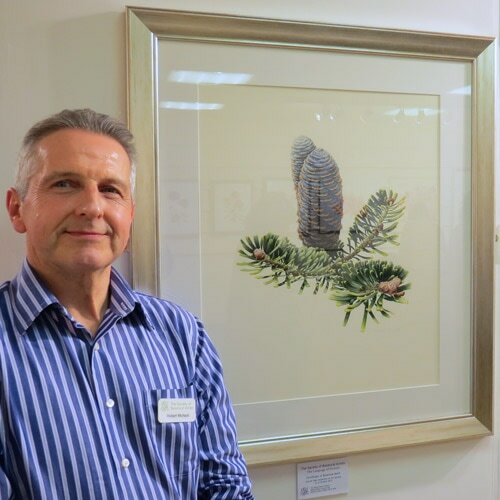 ​Director of Botanical Illustration at the Royal Botanic Garden Edinburgh since 2007, having been first appointed as Artist in Residence in 1997 and subsequently developed the highly successful RBGE Diploma in Botanical Illustration. 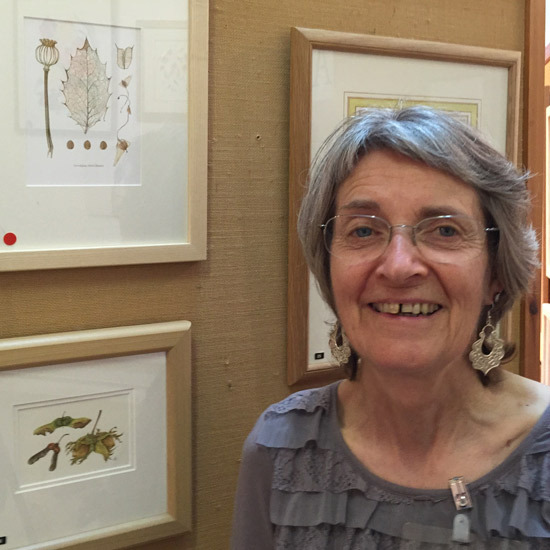 She received an MBE in 2016 for services to botanical art education in Scotland. See Jacqui Pestell-Canavan MBE. Winner of seven Gold Medals (1991-94, 1996, 2015, 2017),. Born in London and has lived in Orkney since 1981. Her GM in 2015 was for 16 paintings of Fritillaria and Helleborus and the one in 2017 for 12 paintings of Clematis. She has also exhibited at the Kew Gardens Gallery, designed the 1997 Chelsea Flower Show Plate which celebrated the Golden Wedding Anniversary of Her Majesty the Queen and Prince Philip and has designed over 150 designs for floral mugs for Dunoon Ceramics. Her works is in the collections of The Royal Botanic Gardens of Kew and Edinburgh, the Hunt Institute for Botanical Documentation in Pittsburgh and the Shirley Sherwood Collection. Degree in Scientific Illustration. Formerly worked as a Botanical Illustrator at Kew. Her watercolour illustrations have appeared in Curtis's Botanical Magazine for Kew, The Plantsman for the RHS and William Stearn's Flower Artists of Kew and other publications by various publishers. She has exhibited with various organisations and now teaches and writes instruction books. Kay Rees-Davies GM (1996, 1998, 2003 and 2010). ​She was taught botanical painting in North Wales by Margaret Stevens. Her paintings are in the collections of the Lindley Library RHS; the Highgrove Florilegium; the Chelsea Physic Garden Archive, and other collections in Britain and USA. Began botanical painting in 2008. Trained as a graphic artist. Selected for 16th International Exhibition at the Hunt in 2019. Awarded Silver-Gilt Medal for Metamorphosis - Life cycle of Papaver Orientale. Her work is included in Eden Project Botanical Illustration books. She likes to paint larger than life size and prefers vibrant subjects. Graduate and prizewinner of The Royal College of Art (2004). A trained Botanical artist who has spent ten years illustrating the vanishing species of flora in the rainforests of SE Asia. Her work on documenting the Zingiberaceae family resulted in a Fellowship awarded by the Linnean Society in 2007 and an exhibition at the Shirley Sherwood Gallery in 2009. Her work is held in the RBG Kew, Singapore Botanic Garden and the Hunt Institute. Studied drawing and painting at the Regent Street Polytechnic School of Art, The Central School of Arts, followed by The National Academy of Art in New York. Major reputation as a mural painter. Work in the collection of Shirley Sherwood. View the e-catalogue for Rosie's latest exhibition (2017) here. This is a large-format book with over 80 of Rosie Sanders's finest flower paintings. Definitely one for those who'd like to know what her big paintings really look like. ​6. In Search of the Black Iris. Elaine is a botanical artist and tutor. Until recently she was the Course Director of the Diploma Course in Botanical Illustration and Painting at the Chelsea School of Botanical Art. She has been invited to provide tuition by various organisations around the world. 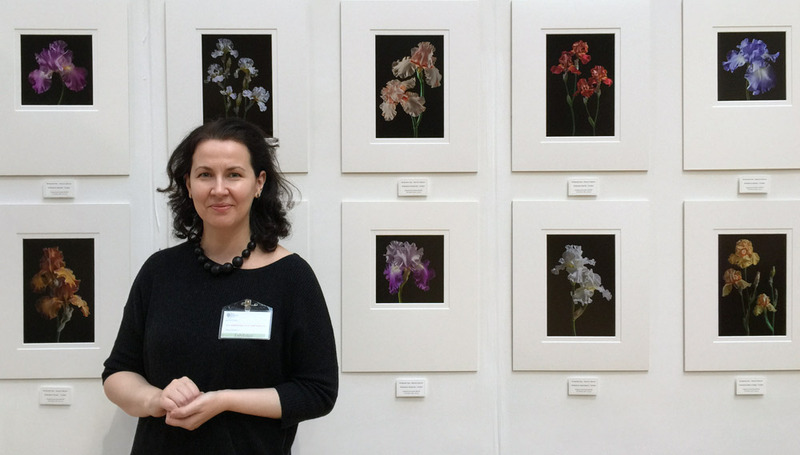 Her work has been exhibited at the Hunt Institute and included in the Highgrove Florilegium, the Transylvania Florilegium and the collection of the Hunt Institute. 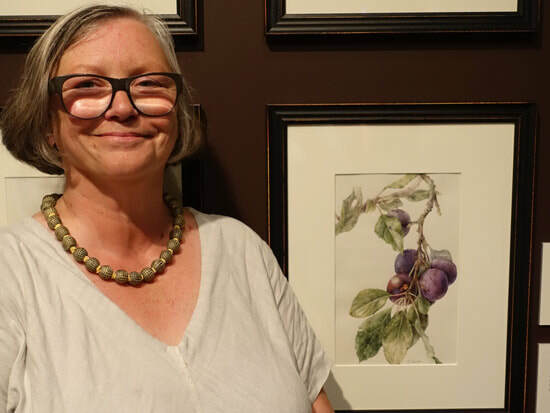 She received the Talas Award at 16th Annual International ASBA Exhibition at The Horticultural Society of New York..
Elaine Searle with her watercolour painting on vellum of the heritage variety Prunus domestica ‘Kirke’s Blue’ at the Tradescant's Orchard Exhibition at the Garden Museum. Gael is Vice President of the SBA. 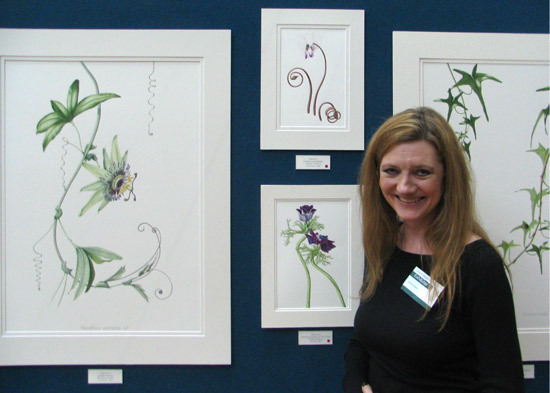 She's a qualified teacher and botanical illustrator who paints in watercolour and sometimes on vellum. She exhibited at the Hunt in 2013 and in 2014 she won an RHS Gold Medal for ‘hydrangea macrophylla in autumn and winter’. In 2018, her first book was published about the plants she grows in her garden - it's a contemporary take on a florilegium. ​The book is organised by season - and laid out month by month hence the title ‘The Measure of the Year. It takes us through Gael's year in her garden and as a botanical artist. The text connects the artwork with the garden and landscape and the time of year. Winner of four Gold Medals. She showed at the Hunt in 1995. Ex member of the Royal Horticultural Society Picture Committee (1997-2005). 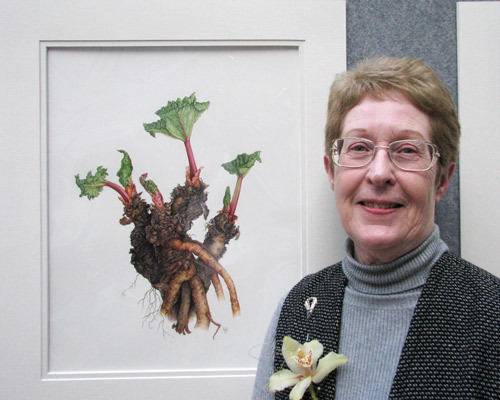 Her work is in many collections, including that of Shirley Sherwood, and many books​, including Contemporary Botanical Artists. She has now, more or less, retired from botanical art. ​Studied Botany at Plymouth and has an MSc in Plant Taxonomy from the University of Edinburgh. Former Assistant Curator at Kew's Shirley Sherwood Gallery, Fellow of the Linnean Society and member of the Chelsea Physic Florilegium Society. 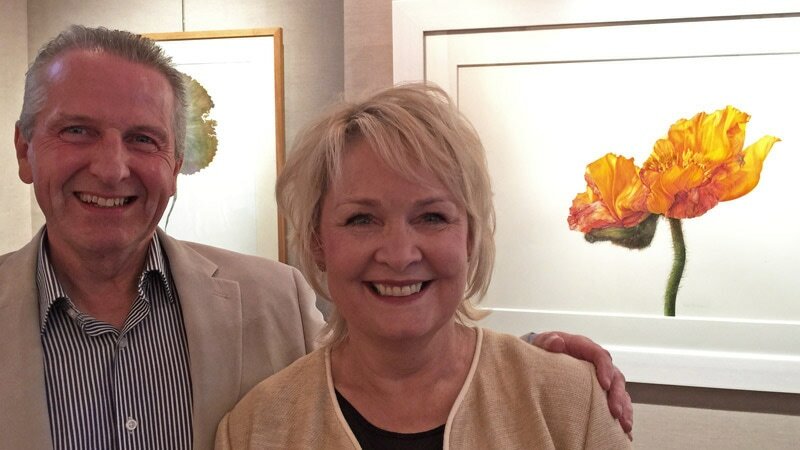 She has paintings in the collection of Shirley Sherwood and other prestigious collections. Develops her art internationally within the context of major projects - the first was leaves, the current one is blue flowers. 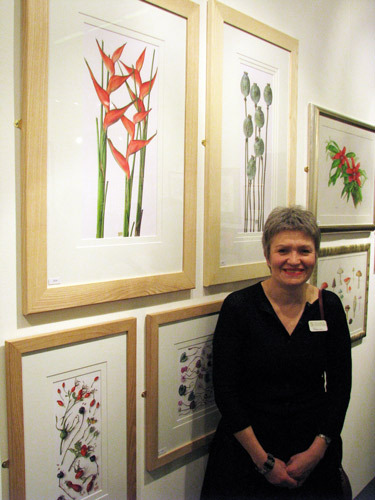 President of the Society of Botanical Artists. Billy graduated from St Martins School of Art with a degree in fashion design and illustration and subsequently changed direction - to the benefit of botanical art. 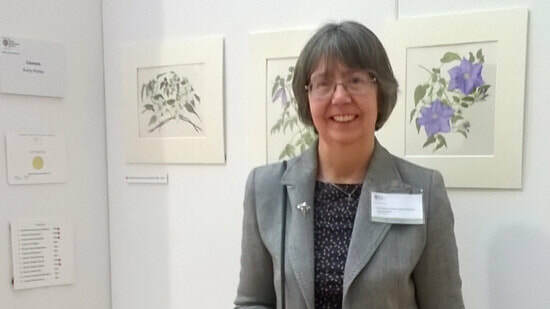 She has won five Certificates of Botanical Merit at SBA exhibitions and has work in the collections of the Hunt Institute, Shirley Sherwood and Kew archives. In 2017, at BISCOT, she won a Gold Medal and 'Best in Show Painting'. ​She's also a very popular teacher of botanical painting and is probably best known as a best selling author of four very popular and highly recommended instruction books about botanical painting. She also has an online botanical art instruction site. 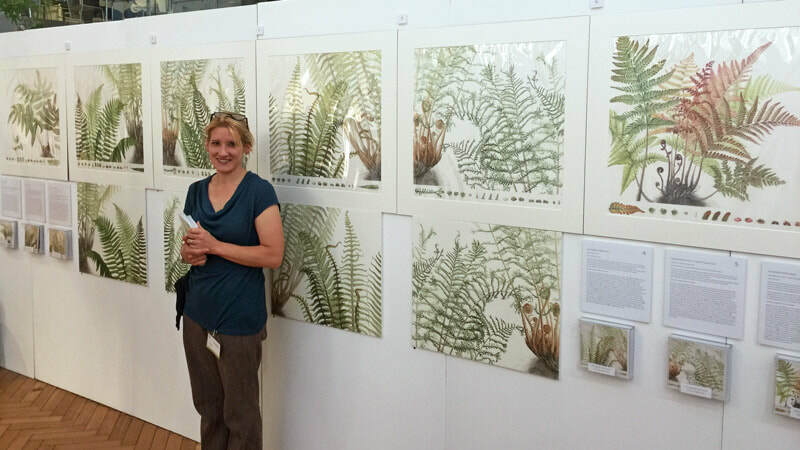 Laura Silburn with her RHS 2018 exhibit "GM Dryopteris: species and cultivars of Dryopteris ferns with an Award of Garden Merit"> The Best Painting in Show award was for the one on the extreme right. Degree with honours in Environmental Science (including 3 years of Botany). Subsequently worked for the RHS Botany Department at RHS Wisley, initially as Administrator for the RHS Horticultural Database and subsequently managing the RHS Botany image collection. Fellow of the Linnean Society. Won an RHS Gold Medal in 1998 for her exhibit of watercolour paintings. Commissioned to produce illustrations for the RHS New Plantsman. Taught short courses in Botanical Art for the RHS Rosemoor in Devon for many years. 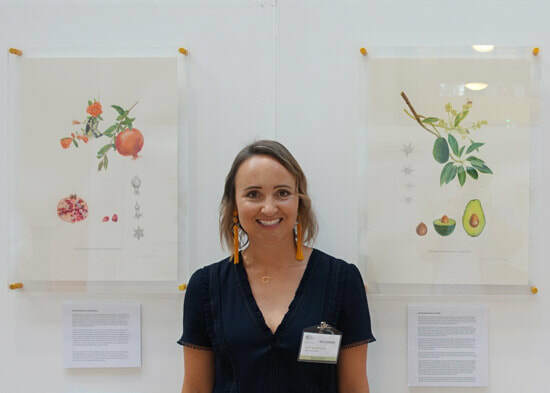 Following a Queen Elizabeth Scholarship Trust award in 2004, Niki has experimented with the use of digital techniques for botanical illustration - and two more Gold Medals. See Botanical Photography below. ​Founder member and Past President of the Society of Botanical Artists and first Director of the SBA Distance Learning Diploma Course. Awarded a Gold Medal by the RHS in 1990. Exhibited two works at the 8th International Exhibition at the Hunt in 1995/96. She is also the author of five books about botanical art. She has exhibited widely and internationally and undertaken a number of important commissions. ​Originally from South Africa, Peta now lives in Sevenoaks in Kent. Focused primarily on South African flora. Gold Medal at 2004 Kirstenbosch Biennale. In 2006 she received an RHS Gold Medal for her paintings of proteas. She has work in the collections of Kew Royal Botanic Gardens, the Lindley Library of the Royal Horticultural Society in London, the Hunt Institute of Carnegie Mellon University in Pittsburgh, and the Shirley Sherwood Collection. Member of the Florilegium Societies in Sheffield and Sydney and has contributed to the Highgrove and Transylavanian Florilegiums. Exhibited at the Hunt. 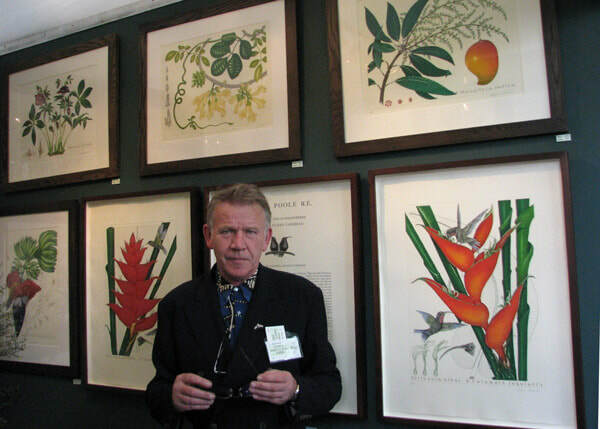 ​A world renowned botanical artist and tutor. Her watercolour paintings are large, complex and very detailed and demonstrate her amazing control over multiple layers of transparent watercolour to create her intense colour and beautifully rendered tone for the smallest details. Her work is included in premier collections around the world - including the RHS Lindley Library, the Shirley Sherwood Collection and the Hunt Institute of Botanical Documentation. You can read more about Fiona in A 'Making A Mark' Profile of Fiona Strickland. See also Fiona Strickland wins The Hort's "Best in Show" Award at 18th Annual International.. Work available from Jonathan Cooper's Park Walk Gallery. ​Below is a video of both Fiona Strickland and Robert McNeill talking about their work. Won her RHS Gold Medal for a suite of paintings of Helianthus annus (sunflowers) and a Gold Medal at BISCOT (endangered conifers) in 2013. She lives in Edinburgh and teaches on the courses run by the Royal Botanic Garden, Edinburgh. Visited Nepal in 2015 to draw and paint plants for the Flora of Nepal project. She has work in the permanent collection of the Royal Botanic Gardens, Edinburgh and Kew. Lives in Wiltshire. Achieved a Distinction in her SBA Diploma. 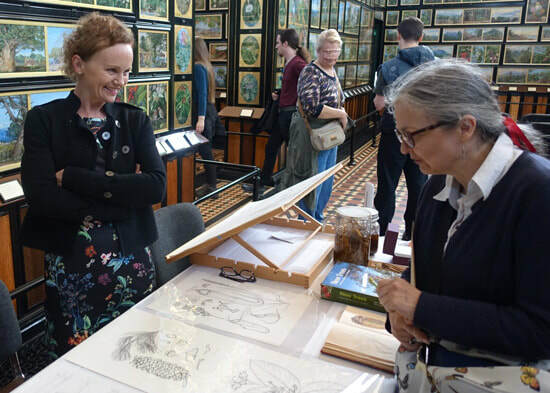 She is a painting member of the Chelsea Physic Garden Florilegium Society, a Fellow of the Linnean Society and an Associate Member of the Society of Botanical Artists. Dahlia 'Twynings After Eight' and the original sketches were bought by the RHS Lindley Library in 2018. He currently lives in Wales. Course Director and a tutor for the Society of Botanical Artists (SBA) Distance Learning Diploma Course (DLDC). Masumi Yamanaka GM (2010) - GM for her illustrations of Aesculus indica ‘Sydney Pearce’. She has a number of works in the collection of the Royal Botanical Gardens at Kew. Its website has images of her paintings of the Heritage Trees at Kew. 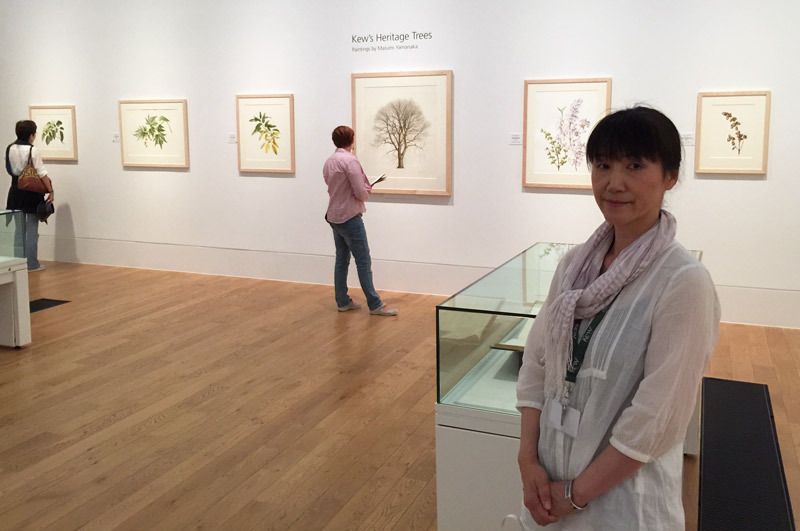 This is my review of the 2015 exhibition in the Shirley Sherwood Gallery Review: Kew's Heritage Trees - paintings by Masumi Yamanaka. She is currently a resident artist at Kew. ​A New Zealand artist who now lives and works in London. Trained as a botanical artist at Kew where he worked under Dr Christopher Grey-Wilson, former editor of The Kew Magazine. 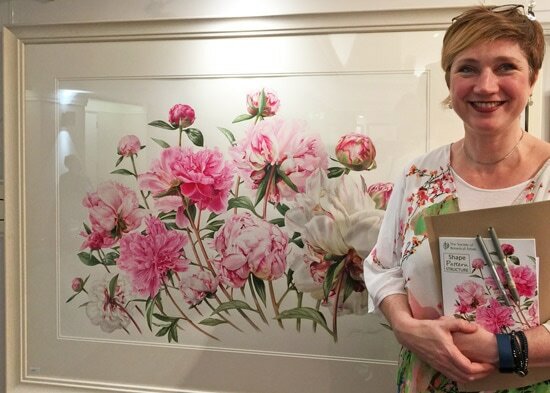 "Bryan Poole ...has the gift to be able to combine traditional methods of illustration and reproduction with a very modern approach to botanical art and design..."
​Susan is Vice President of the Society of Botanical Artists. She works in coloured pencils and is particularly well known for her composite drawings. She has won two RHS Gold Medals and numerous other awards. She is a member of the Sheffield Florilegium Society. Won an RHS gold medal for a series of paintings of orchard fruits and was awarded the accolade of ‘Best Botanical Artist in Show'. She also been exhibited at the 13th International Exhibition run by the Hunt Institute. ​This was the first book by a Gold Medal Winning Botanical Artist to focus on how to create very high standards of botanical art in coloured pencils. ​It remains a bible for very many coloured pencil artists. One of the leading botanical artists and art tutors in pencil and coloured pencils. 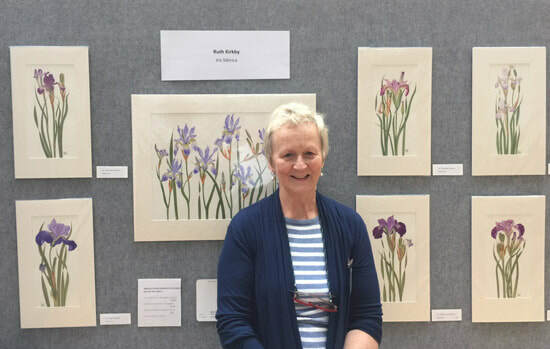 She's won four RHS Gold Medals for Lycastre Orchids from the National Collection and has had three works purchased by the RHS Lindley Library. She is also a member of the RHS Picture Committee. Her book about using coloured pencils for botanical art was published in 2009. 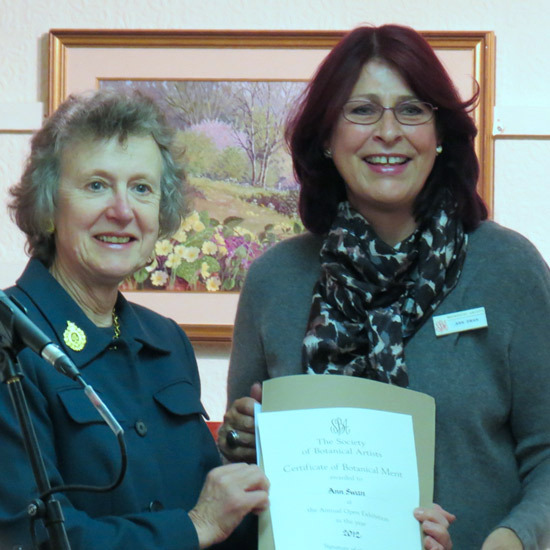 Ann Swan (right) receiving a Certificate of Botanical Merit from Elizabeth Banks DL, the then President of the Royal Horticultural Society, at the 2012 Annual Exhibition of the Society of Botanical Artists. 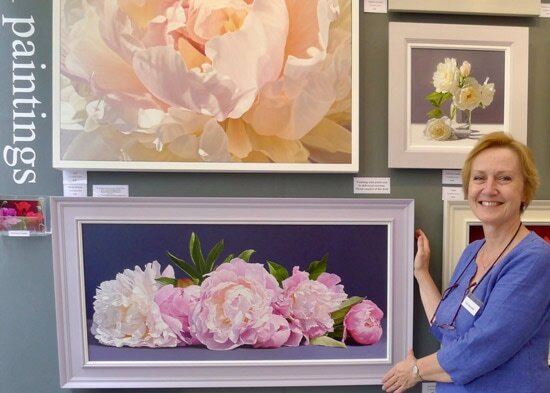 Linda Alexander with her paintings on her stand at the RHS Chelsea Flower Show 2017. Pen and ink is primarily used by professional botanical illustrators because of the ease and cost associated with images for publication in scientific journals. In addition, most botanical illustrations in pen and ink are made from material from a herbarium which has lost all colour. Illustrated plants for Kew for 12 years. 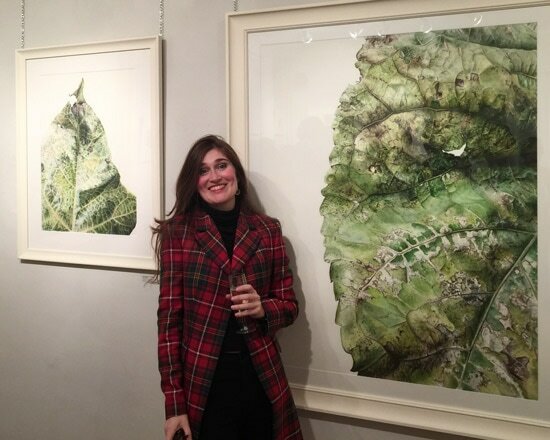 She has a degree in botany and won an RHS Gold Medal for her botanical drawings. 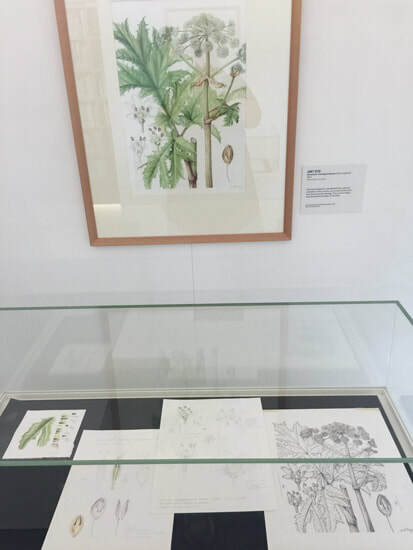 She also produced pen and ink drawings for the Alpine Garden Society’s Plant Encyclopaedia (now online), the Royal Horticultural Society’s Dictionary of Gardening and Beth Chatto’s Plant Portraits. Now active with Iceni Botanical Artists and teaching botanical illustration. Karen Musgrave Hill won an RHS Gold Medal at Malvern in 2015 for six chrysanthemum flower heads drawn three times larger than life size in pen and ink. She normally works in coloured pencil, graphite pencil and pen & ink. Known for her quite remarkable draughtsmanship in pen and ink. Has produced many line drawings for RHS Manuals and dictionaries. Has won a number of RHS Gold Medals and also exhibited at the Hunt. My first encounter with her work had me inspecting the tiny pen and ink marks she uses and her total control of tone. Dr Sherwood is a big admirer of her drawings and owns a number. (e.g. see Banksia coccinea 1996 Pen and ink drawing A Passion for Plants page 229). Illustrated the RHS Concise Garden Dictionary. Worked as a botanical illustrator for Kew Gardens, specialising in pen and ink drawings of new plants. Awarded the Jill Smythies medal for botanical illustration by the Linnean Society in 2011. Her illustrations have been published worldwide in a number of Journals, Books and Floras. Born in Zimbabwe. Completed a BSc degree at Rhodes University, South Africa, in 1994. Has worked as a freelance botanical illustrator for Kew since 2001. 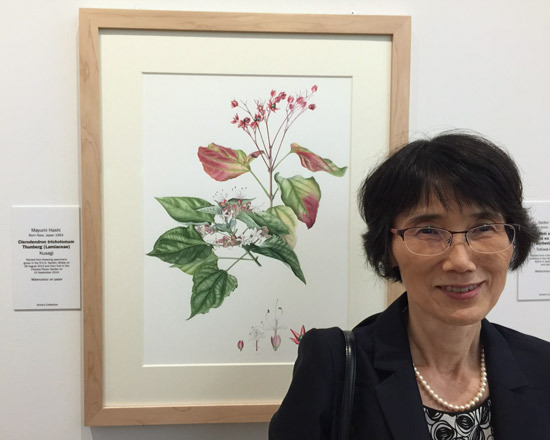 Her drawings have been published in 14 scientific publications including the Kew Bulletin, the Botanical Journal of the Linnean Society and Curtis’s Botanical Magazine. She completed 110 illustrations for the book 'New Trees: Recent Introductions to Cultivation' which was published in 2009 by the International Dendrology Society and Kew. These drawings are now owned by a significant collector. Currently engaged on a large commission for Singapore Botanic Gardens. Studied Graphic Information Design in London, MA Graphic Design in Leicester and Botanical Illustration at the University of Sheffield and she specialises in illustrating habitats associated with urban places or historical economic activity. She has two RHS Gold Medals - Plants of the Urban Wasteland (Nov. 1997); Rare and Endangered Cornfield Flowers at Ryedale Folk Museum (Jan.2002). Her most recent project have involved illustrating metallophyte flora of old lead mines in the North Pennines and the Peak District and Coal, Collapse, Colonisation: Plant Species Colonising the Decaying Industrial Features of an Abandoned Victorian Colliery. She has exhibited widely in the UK. Jan Cassidy GM has won two Gold Medals for her lichen photography. She is a a Cambridge based writer and environmental photographer who teaches photography to women. ​Laurence Hill GM won Gold in the RHS Botanical Photography Exhibition 2014 for a unique display of Kobaimo - Japanese Endemic Fritillaria which impressed in terms of both scholarship and techniques. Plus Gold in 2017 for "Deconstructed Fritillaria"
​a Russian photographer based in the UK has won Gold Medals for her botanical photography in 2014 and 2015 after a series of Silver Gilts. 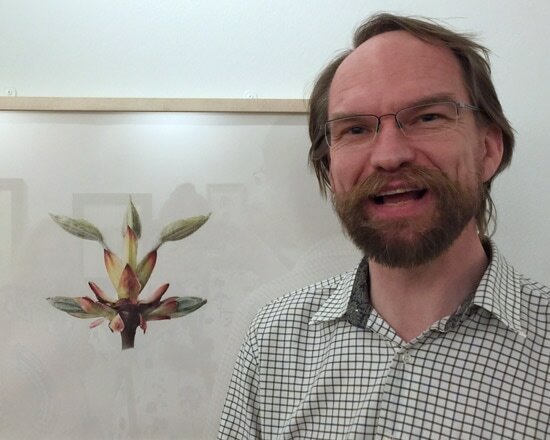 A botanical artist (see Botanical painters above) and Fellow of the Linnean Society who now specialises in using digital techniques, including photography, for botanical illustration. 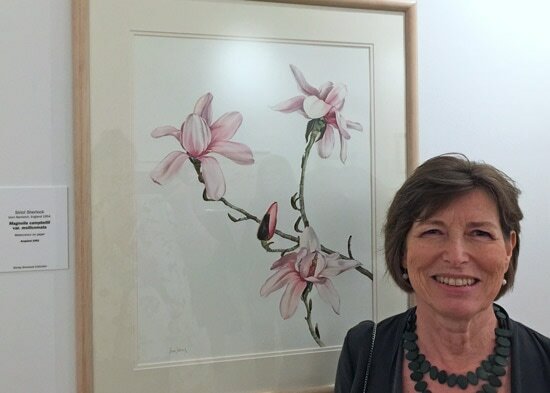 In 2018, she received the Jill Smythies Award for excellence in botanical illustration from the Linnean Society. Niki has exhibited widely - a number of solo exhibitions solo exhibitions in BGBM Berlin, Germany, at the invitation of Herr Professor Lack (2007); in the UK at RHS Hyde Hall, Essex (2009), The Garden Museum, London (2010) and RHS Wisley, Surrey (2012). Her work is held in collections at RBG Kew, RHS Lindley Library and the Linnean Society of London. Commissioned to illustrate The Vegetative Key of the British Flora (2009). Her briar rose illustration was selected for the book Plant: Exploring the Botanical World.